One of the many challenging aspects of China’s rapid urbanisation is how to deal with the ever increasing amounts of solid waste. Maximilian Rech, Programme Director and Assistant Professor for International Affairs at ESSCA School of Management, provides some details on good practices in waste management and identifies areas for EU-China cooperation. Municipal solid waste (MSW) is an important aspect of urban planning and sustainable city management. Sharing best practices of MSW management can help to clean the air and reduce green house gas (GHG) emissions. Therefore, technical and economic cooperation on urban waste management seems like a logical building block for EU-China cooperation. 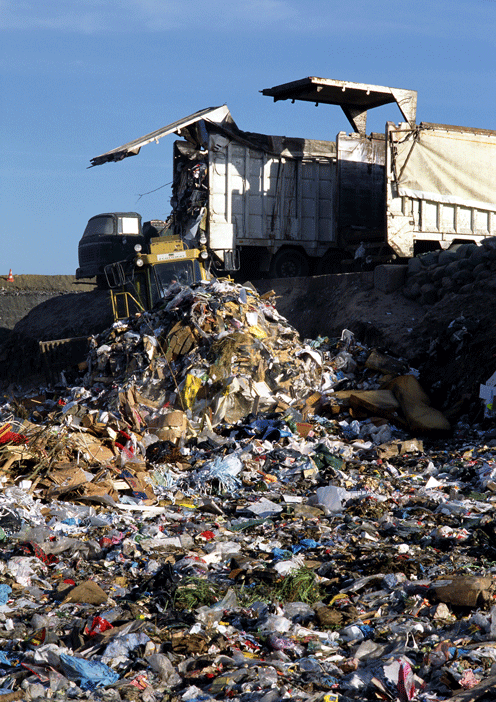 According to the World Bank, MSW “comprises refuse from households, non-hazardous solid waste from industrial, commercial and institutional establishments, market waste, yard waste and street sweepings.” Developing an integrated strategy for MSW management not only helps reduce waste volumes and offset resource demands, but also promises economic returns to municipalities that address sustainable urban waste management. When analysing MSW generation, it is important to differentiate between construction waste, industrial waste and household waste. Construction and industrial waste can represent as much as 40 per cent of MSW and the composition of industrial waste differs from one region to another depending on the dominant sector and the local industrial structure. It is therefore useful to focus on household and general waste in municipalities, which share similar patterns of waste composition across regions. This allows identifying trends and recommending policy actions to improve municipal waste management. Per capita generation of waste varies from one country to another. Regional differences can be explained by cultural as well as economic factors. While China’s waste generation has increased rapidly over the past decade, per capita waste generation is still relatively low. Based on World Bank figures, it has been argued that “[n]o other country has ever experienced as large and as fast an increase in solid waste quantities” as China. According to the Organisation for Economic Cooperation and Development (OECD), per capita generation of MSW in China is at 0.98 kg/day, comparable to the level of Mexico and slightly above the average for East Asia. 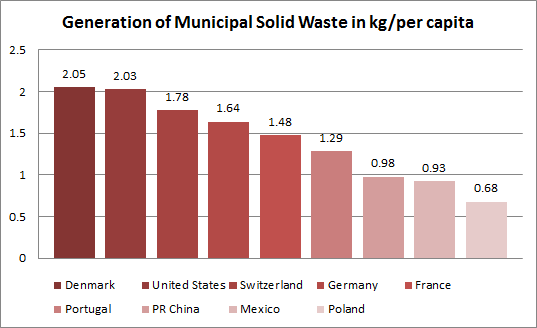 Many European countries feature in the medium range of per capita waste generation with Germany generating 1.64 kg/day. Larger per capita ratios can be found in the United States, Denmark or Switzerland. While this indicates a correlation between affluence and generation of MSW, this link is not undisputed because of flaws in data collection. While per capita generation increases, household waste might decrease due to increasing time spent elsewhere and decreasing amounts of meals consumed at home. Hence, the general positive correlation between increasing affluence and increasing MSW generation holds true, but more accurate data is needed. In terms of household waste composition, China features a very high degree of biodegradable waste and moisture. Scientific research suggests that China’s high proportion of organic waste is due to cultural specificity of a diet characterised by fresh vegetables and fruit. 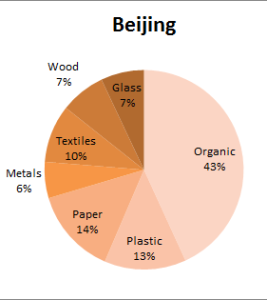 A comparison of Beijing and Berlin confirms that increasing affluence will not necessarily lead to a decrease in the amount of organic MSW generated. In both cities, the percentage share of biodegradable MSW is as high as 40 per cent. Given this high proportion of organic waste, there is considerable potential for improved source separation and subsequent composting. Source separation of household waste in Beijing and other Chinese cities can still be improved. 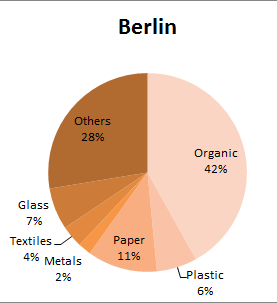 Waste collection in Berlin, for example, is organised partly by public, partly by private entities. Residents and businesses separate their waste individually and then dispose of waste in coloured bags and bins in the courtyard. The respective bins are then collected regularly, either by a public or private MSW collection scheme. At the same time, households also participate in a deposit refund system returning bottles and cans to their local retailer. Through source separation and the deposit refund scheme for households and businesses, Berlin realises a nine-fold source separation of MSW. This leads to more homogenous waste and has advantages for recycling and reuse of waste, but also allows for much greater recovery of energy from waste. Hence, it is not only in the interest of the environment to conduct integrated MSW management – it actually promises economic returns to any municipality willing to take these steps. When introducing a strategy for sustainable MSW management, it is important to involve all relevant stakeholders from civil society, business and all levels of government to ensure efficient implementation of sustainable and more efficient MSW management. While China and Germany have already introduced relatively sophisticated MSW management schemes, large-scale, nationwide standards and their implementation are still lacking. Each of the relevant stakeholders can play a conducive role: governments provide legislation and ensure implementation, civil society and businesses can increase source separation and at times offer innovative solutions to improve MSW management. What is more, mayors and local bureaucracies can play a pivotal role, especially in the implementation of waste management technologies. 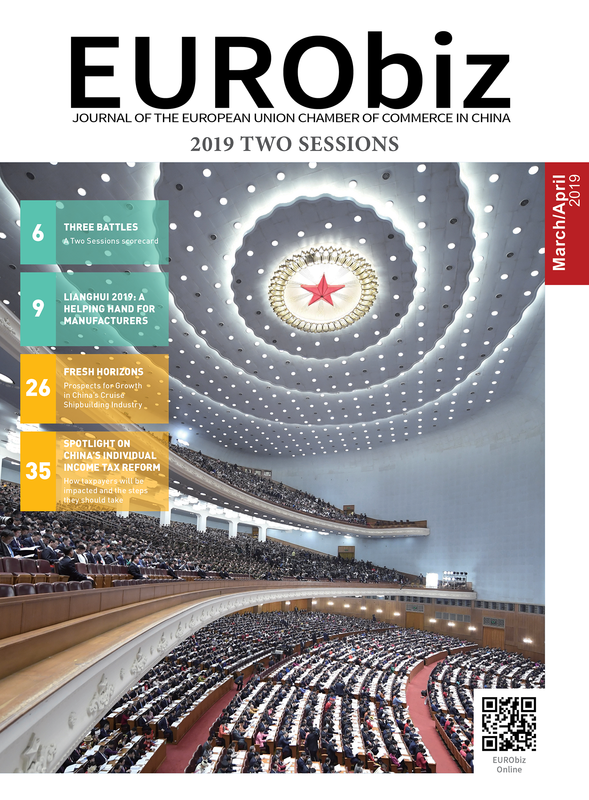 A closer framework for EU-China cooperation could facilitate exchange of technology and best practices – the EU-China Partnership on Sustainable Urbanisation could be a useful vehicle to structure such cooperation. The largest potential can de discovered by introducing more biogas power plants that can divert organic waste from regular disposal to biological composting. In China, where business and household waste is made up to approximately 40 per cent of organic waste, the potential for biological fermentation and biogas production is very promising. By separating regular disposal of waste from biological waste, the moisture of the regular MSW will even decrease, leading to an increase in the caloric value of regularly disposed waste and increasing the efficiency of incineration. This in turn eases the demand for coal or liquefied natural gas for co-firing purposes and decreases the amount of residues from incineration. Hence, the air will get cleaner and highly toxic leftovers from incineration will be reduced. From a geopolitical point of view, this also ensures energy security by fostering further diversification of supply. Improve source separation, relying on businesses and households. Realise the potential of composting – energy from waste and reduced GHG emissions. Enhance efficiency of incineration – energy from waste and reduced GHG emissions. Reduce direct landfill disposal – reduced GHG emissions and reduced wastewater leakage. Use financial incentives to prevent packaging and waste – a ‘pay as you throw’ system. Formalise scavenging activities – involve scavengers in municipal solid waste management. Hence, EU-China cooperation on municipal solid waste management should focus on sharing best practices and particular focus should be paid to making more use of the large amounts of organic waste from households and businesses. To that end, all businesses and consumers need to be engaged to drive effective change. ESSCA School of Management is a leading European business school equipping students and managers for a successful and sustainable career while taking fully into account the human and social dimensions of a globalised world. This is achieved through high level academic and professional management programmes, developed by research-active faculty, a strong student mentoring system and respect for the traditional humanist values on which the school was founded. Established in 1909, ESSCA School of Management has ten campuses worldwide and has received the internationally renowned AACSB and EPAS accreditation. Schübeler, P., Christen, J., Wehrle, K. (1996), Conceptual framework for municipal solid waste management in low-income countries, SKAT (Swiss Center for Development Cooperation), p. 18. Zhang, D. Q., Tan, S. K., Gersberg, R. M. (2010), Municipal solid waste management in China: Status, problems and challenges, Journal of Environmental Management, 91(8), p. 1624. Friends of Europe (2012), Greening China’s cities of tomorrow, Understanding China, policy briefing by Shen Wei and Peter Taylor, edited by Shada Islam and Maximilian Rech; Zhang; Tan; Gersberg, op. cit. Hoornweg, Daniel; Bhada-Tata, Perinaz (2012), What a Waste: A Global Review of Solid Waste Management, World Bank, Washington, DC. World Bank, <https://www.wdronline.worldbank.org/handle/10986/17388> License: CC BY 3.0 IGO; Ling Qiu (2012), Analysis of the Economics of Waste to Energy Plants in China and MSW Sorting Models in China and Potential for Improvement, Department of Earth and Environmental Engineering, Columbia University. Zhang; Tan; Gersberg, op. cit., p. 1625; YANG Kai, YE Mao, XU Qi-xin (2003), Environmental Kuznets Characteristics of Municipal Solid Waste Growth in Shanghai City, Department of Environmental Sciences, Urban & Environmental Open Laboratory, Ministry of Education, East China Normal University. Zhang; Tan; Gersberg, op. cit., p. 1625; Chen, X., Geng, Y., Fujita, T. (2010), An overview of municipal solid waste management in China, Waste Management, 30(4),p. 718; World Bank (2005), Waste Management in China: Issues and Recommendations, Urban Development Working Papers, East Asia Infrastructure Department World Bank, Working Paper No. 9. BSR – Berliner Stadtreinigung, BSR – Berliner Stadtreinigung (2012), Die Berliner Stadtreinigung im Überblick 2011, Provision by e-Mail from BSR corporate communications department p. 64; Berlin Senate – Berlin Senate Department for Urban Development and the Environment (2013), Abfallwirtschaftskonzept. Pires, A., Martinho, G., Chang, N.-B. (2011), Solid waste management in European countries: A review of systems analysis techniques, in, Journal of Environmental Management, 92(4), p. 1044. Share the post "Why waste it?"